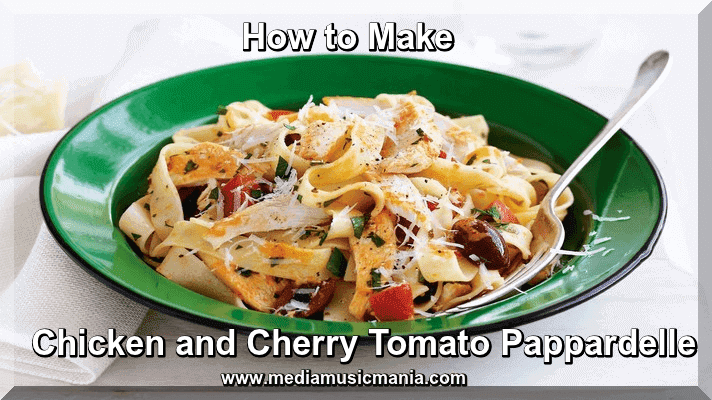 This article is about that how to make fresh Chicken and Cherry Tomato Pappardelle. This is is simple, prepared with simple things which I mention in this Article. Bite-sized pieces of chicken cook in record time and go beautifully with sweet cherry tomatoes and Pappardelle, a wide ribbon pasta, tossed with peppery rocket for a fresh flourish. Delicious. Heat the oil in a frying pan with lid. Add chicken and stir-fry over medium heat until lightly colored. Reduce heat slightly and stir in Tomatoes. Cover pan and simmer, stirring occasionally, for 8-10 minutes or until Tomatoes are very soft and chicken is cooked through. While sauce is simmering, cook Pappardelle in a large saucepan of salted boiling water for 10-12 minutes or following packet instructions, until al dente. Drain. Peel, halve and dice the peaches. Add to the snow peas, along with the prawns. Stir rocket into sauce and season to taste. Transfer pasta to a large warmed serving bowl. Spoon over sauce and toss gently to combine. Server immediately.